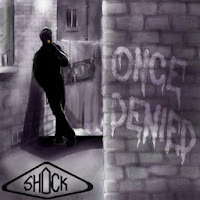 Canadian band Shock’s debut CD, "Once Denied" has been almost 30 years in the making!! That’s a helluva long time to wait for a first offering, but it was certainly worth every minute of time. Forming in Ottawa, The Great White North’s capital city in 1985, Shock was considered in many circles to be the best unsigned band of the late 80’s era. It was the frustration in finding a suitable record deal that ultimately led to their disbandment in 1990, never issuing a recording. This earned them another tag line “the best band to never release an album", but that moniker was abolished when “Once Denied" hit the shelves in May of 2013. The band, comprised of original founding members, Tony V handling the vocal requirements, John Tennant wailing on the guitar and Steve Monette’s thundering bass are joined by newcomer Chad Walls behind the kit in this venture which has seen them also opening for Canadian thrash heavy weights Annihilator. "Once Denied" is a little short on the run time with only 8 songs, but all killer, no filler by any means….this album is all hard rock gems with decidedly thrashy overtones, each song getting better the further you enter the album. All of the songs were chosen from the band’s extensive back catalogue for this epic release, almost thirty years in the making. “Slashing to Live", may well be there most widely known song and could be considered the lead single given that it has also received the video treatment in the way of a cartoon depicting the story and message of the song concerning women’s self defense. “Paths of Glory" also has a video to accompany it and both are a good introduction to the albums sound. Other stand out cuts include “Fighting Chance", Splitting the Atom", Flaming Towards Earth", “Full Speed Ahead", “Driven To Kill" and “I’m Dangerous"....oh wait I’ve just named all eight tracks as absolute stand outs of the record…….and there’s a reason for that! Once Denied is the kind of album that grows on the listener with each spin, infecting you like a drug that you just can’t get enough of…..I listen to it at least once a day and with it’s relatively short runtime that’s easy to fit into even the busiest of schedules….a great way to start the day! Given the repertoire of music that this group have stashed away, one can only hope that Once Denied will be followed with more releases. Good things come to those who wait…….and you’ve been waiting for this whether you know it or not! TWELVE CLAY FEET: "More Naked Than Obscene"
SPIRITS OF THE DEAD: "Rumours Of A Presence"
TRAINWRECK ARCHITECT: "Traits Of The Sick"
David BRONSON: "The Long Lost"